Hello, Margaretha, I'm back from my travels and what a lovely picture to start my catching up. I love the muted colours and the sleeping dog makes me want to type very softly! I love this picture too, and long for the season when I can rest outside. The pattern on the blanket(?) she is lying on looks like an apron I wove many years ago. 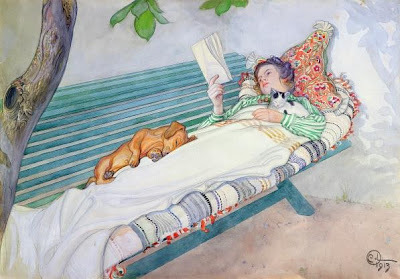 I used to have notecards that were all pictures of women reading and this was one of them. I love this picture...I want it to be me, there. But my little black poodle, not a dachshund. It's one of these paintings that you easily "move into". I had a poodle as a child so I too change the image to suit me, and the cat is there too. We need to dream about summer this time of the year! And yes, snow is pretty - but spring is prettier!